The web-based enterprise system lets partners and local farmers easily access information. With GIS, managers can access integrated and real-time data. ArcGIS promotes efficiency, productivity, and improved environmental outcomes for sugarcane growers. 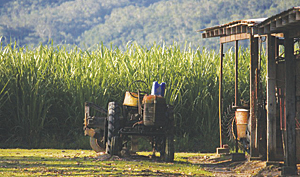 The roots of cooperative sugarcane cultivation in the Herbert River catchment basin in North Queensland, Australia, can be traced to the early 1880s, when six small-area landowners formed the Herbert River Farmers Association. Shaped by the social and economic conditions of the day, the landowners believed that both the sugarcane industry and local residents would be better served by cooperative farming rather than the plantation model that had flourished in the area for the preceding 20 years. Herbert Information Portal showing harvested areas and cane harvester movements. Two years later, Colonial Sugar Refining Company (CSR), the primary sugarcane processing company in the region, offered agreements to the newly formed association to centrally mill its cane. In 1891, CSR subsequently subdivided its Homebush Estate into small farms, which it leased to local farmers with an option to buy. Though farming methods in the Herbert River catchment have changed greatly during the succeeding 130 years, its cooperative nature has grown even stronger with the founding of Herbert Resource Information Centre (HRIC). Established in 1996, this nonprofit organization supports the sustainable development of the sugarcane industry in the Lower Herbert River catchment through technological innovation and is responsible for building community networks between local industry, government, and residents. Shortly after its formation, HRIC conducted a mapping project of the Herbert River floodplain. The results of the project proved difficult to disseminate to both the HRIC coalition and the local farming community. Members decided to implement a GIS that would allow HRIC to better analyze local sugarcane farming and distribute its findings. Consequently, HRIC launched Herbert Information Portal (HIP), a collaborative GIS using Esri software. 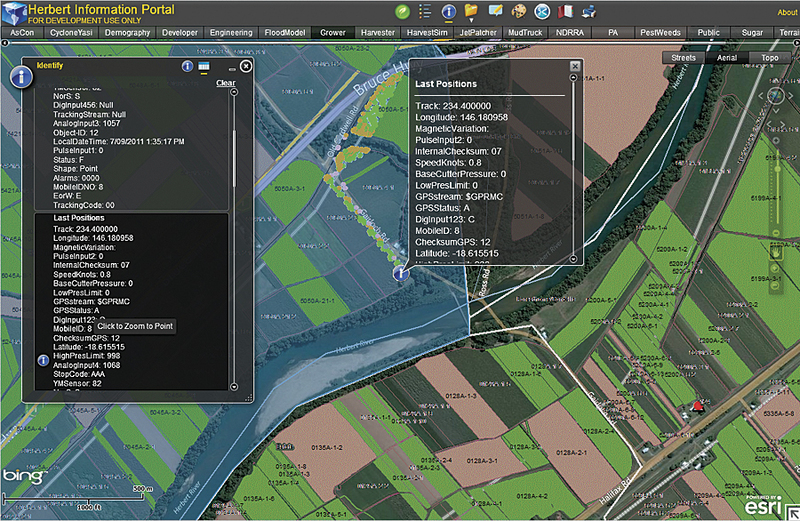 Today, HIP has evolved into an enterprise system built on ArcGIS for Server and ArcGIS for Desktop and extensions. The GIS is web based so that HRIC partners and local farmers have easy access to information. HIP supports most of the critical business processes in the region's sugar industry supply chain by acting as the catalyst for implementing precision farming technology, from improved harvesting and transport management to more efficient milling operations. Applications include Cane Mapping and Management, Real-Time Cane Harvester Monitoring, Sucrogen Rail Safe Integration, and Cane Yield Monitoring systems. These applications use GIS to promote efficiency, productivity, and improved environmental outcomes for HRIC partners and sugarcane growers. Because the Herbert River catchment basin is sandwiched between two environmentally protected areas—Wet Tropics World Heritage Area and Great Barrier Reef Marine Park—the cane-growing industry uses the tools provided by HRIC to improve productivity while monitoring and reducing impact on the environment. "Though initially established as a technology center," says Raymond De Lai, HRIC manager, "we quickly realized that the most significant value that HRIC could provide to our partners was the opportunity to build and enhance relationships among people and organizations. We are strongly focused on building trust, commitment, and cooperation through a shared vision among our partners and the wider community." Technology has come a long way for sugarcane farmers in the Herbert River catchment basin of North Queensland, Australia. The partners in the HRIC project include local government representatives from Hinchinbrook Shire Council; the CSR group that refines and transports the processed sugarcane; and Terrain Natural Resource Management, a nonprofit agency that builds regional consensus for natural resource management. Also included in the management coalition are representatives from the Bureau of Sugar Experiment Stations and Herbert Cane Productivity Services, which provide research, development, and extension services to the sugarcane industry. "For us, the advantage of a partnership approach to an enterprise GIS is the sharing of its cost, risk, and—of course—the benefits," says De Lai. "Any one of our HRIC partners would find it very difficult to fund their own system. Together, we are able to buy into a large enterprise GIS infrastructure, data management processes, capacity building, and a relationship with our partners that provides benefits beyond GIS projects." The mutual support and interaction between HRIC and the community is essential because sugarcane production in the area is a complicated process that includes a number of well-coordinated steps, from planting to harvesting. The process is underpinned by the automatic collection and transmission of spatial data to HIP for analysis and decision making. "Our sugarcane growing and harvesting procedures require a high level of interdependence within the community because the process is not vertically integrated, except for the milling and transport," says De Lai. "We rely a great deal on the growers to provide regular updates on the status of their fields." Because sugar production can be increased with better management of harvest scheduling and decision making based on regional variations in soil, irrigation, and climatic conditions, the growers have fitted their harvesting equipment with onboard computers, electronic logbooks, base-cutter height sensor kits, and yield monitors. Data is automatically collected by the sensor systems installed on the tractors and other field equipment and transferred to HIP for processing and analysis with ArcGIS. When analyzing yield variation within a field, the system suggests how growers may be able to reduce their costs through varying farm inputs. By closely managing irrigation and monitoring climatic conditions, the optimal harvesting time can be determined to maximize the sucrose content in the sugarcane. An increased sucrose yield increases the profitability of the harvest. 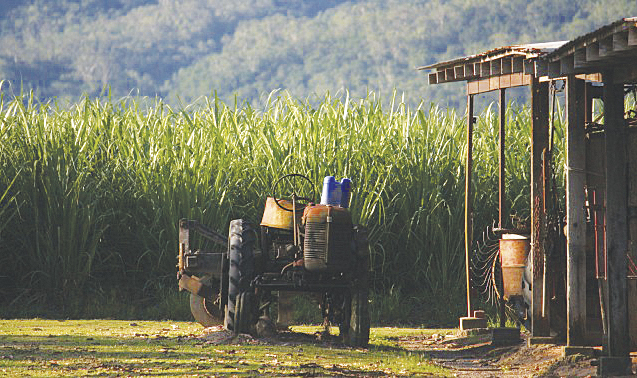 Since harvesting is the costliest activity on a sugarcane farm, it is important to keep the cane harvesters in constant operation during the cutting season. This is facilitated, in part, through the use of Twitter, the social networking site. Farmers Tweet the status of the harvester in their field so that the owner of the subsequent field knows exactly when the equipment will arrive to begin the next job. It is expected that this concept will be used for other projects in the near future, such as identifying the location of cane trains and broadcasting the estimated times of arrival. "Using enterprise GIS has allowed us to integrate our various data inputs and provide real-time access for managers and decision makers," De Lai concludes. "In development terms, we are doing things now in hours and days that would previously have taken us weeks and months. Technically, we can put in place anything we envision at the moment. Our challenge is to identify the business models that are sustainable and support those opportunities through GIS." For more information, contact Raymond De Lai, HRIC Center manager (e-mail: rdelai@hinchinbrook.qld.gov.au).